If the rider heard he made no sign. Clad in a silver helmet and armored in brown leather, he galloped under the arches, my warning ignored. His great black horse circled the courtyard, raising dust as he halted in front of the steps. For a moment he didn’t move. Nor did I, except to tighten my fingers on the handle of my blade. He lifted off his helmet. A pair of piercing eyes met mine. The knowledge flashed into my brain. The man in front of me was tall and strong. Many years younger than my father, perhaps thirty years of age, his face a tanned brown. His hair, tawny as an owl wing, fell to the studded collar of his armor, its leather stretched across his shoulders. Dirt swirled in the air as his horse hoofed the ground. River deep turned his gaze as he took me in, lingering on the thick braid that fell over my shoulder to brush to my thigh. “Well?” A flame flickered though me, hotter than fear. A flame I’d never known. What an emotional ride! Both literally and figuratively! This book is devoted to Lady Godiva, her story and what drove her to carry out her famous naked ride. Of course, some true facts were included in the retelling, but a plot twist was the added element, that made the legend seem a little nicer, in some ways! I have to admit that I'm not very familiar with the true myth of Lady Godiva's ride. Before reading this book, I only knew about the trivia I had stumbled upon. But, through this emotional retelling I currently feel so sympathetic towards Coventry's Lady, her personality, as it is being described in the book, as well as the decisions she had to make. Lady Godiva, the narrator of the story, is a strong, independent protagonist, that I was very delighted to read about. I loved the way her thoughts were cited by the author. Especially these flashbacks where she remembered moments from her past, they were seeming so real, and like everything that takes place in a person's mind. Everything so beautifully described! Her joy, her pleasure, her agony, her grief. A well-built heroine, I greatly enjoyed to follow through on her adventures! Her husband, Leofric, was a mysterious man who inspired so many feelings on the heroine, that made me think for a moment I was feeling all those sentiments myself. At first so closed to himself and to his own thoughts, he would allure Godiva, for sure. At some point, I thought that even a love triangle would form between the heroine, the brave warrior Leofric and Edmund, her childhood friend, who had already asked for her hand in marriage. Godiva sure seemed attracted to him at first, but the passion was nonexistent until Leofric made his appearance. After that, the way the heroine's feelings evolved was so wonderfully narrated, making the readers feel the anguish which Lady Godiva felt, whenever the story was taking an unexpected turn. And, that didn't occur rarely in the case of this book. Things were constantly kept interesting with all this background story evolving on its own, hidden until the moment everything became clear. The author delivered the myth in such a way to make us actually wonder whether the events took place as the legend says, or if there was actually something the lords of Coventry liked to cover, underneath it. I won't spoil the ride Lady Godiva carried out, and the exact sentiments this event, and the way everyone in the town responded to it, brought on to me. It was a very delicate part of the book, and one where the feelings escalated. of a greatly emotional ride. Eliza Redgold is based upon the old, Gaelic meaning of her name, Dr Elizabeth Reid Boyd. She was born in Irvine, Scotland on Marymass Day and currently lives in Australia. She has presented academic papers on women and romance and is a contributor to the forthcoming Encyclopedia of Romance Fiction. Eliza has also written two upcoming Victorian historical romances for Harlequin Historical. Look out for ‘Enticing Benedict Cole’ in November 2015. 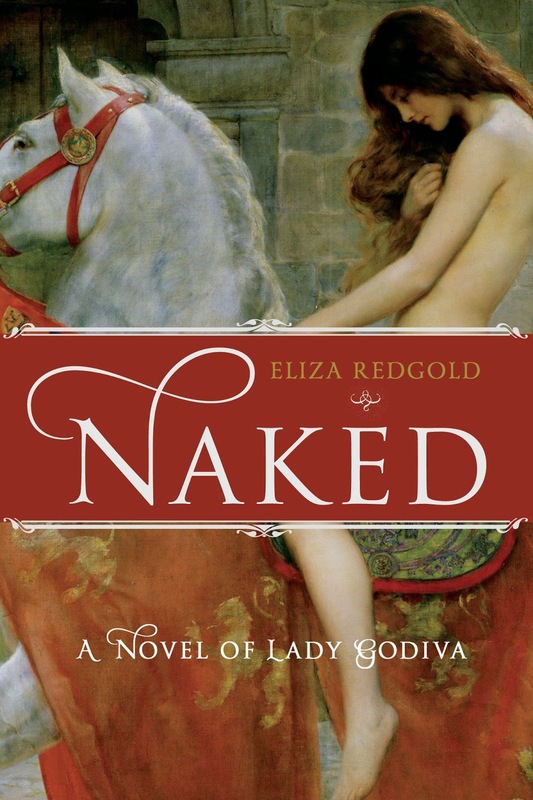 “NAKED: A Novel of Lady Godiva” was released internationally by St Martin’s Press New York in July 2015. Eliza Redgold will be awarding a $20 Amazon or Barnes and Noble GC to a randomly drawn winner via rafflecopter during the tour, and a $20 Amazon or Barnes and Noble GC to a randomly drawn host. This is such a wonderful review of NAKED - thank you so much! Sounds like a terrific read, thanks for sharing it and your review!